Norwegian Gold® Super Critical Omega is a maximum-strength fish oil supplement with 1,125 mg Omega-3 per softgel for potent heart and joint support. It is super concentrated to 95% total Omegas and also contains 1000 IU Vitamin D3 in each burp-free softgel to help give your body what it might be missing. Dosage: For best results take 1 softgel daily, with or without food or as directed by your healthcare professional. 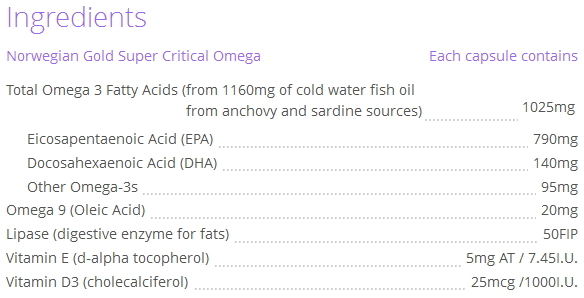 To maximize your Omega intake, take 2 softgels daily.